My word for this month is "froth" which is what May has done despite the wet, the below average temperatures and those bitterly cold winds. May has seemed more like March at time but despite all this there has still been the frothing and fizzing I associate with the month. The cow parsley that lines both sides of our lane up to the main road was fabulous, the chestnut candles have shimmered and as the month ends the elder opposite the kitchen window is just coming into flower. In the garden the usual May suspects have been in full flow. I've very few photos to share this month as my camera woes continue. I'm still struggling with my relatively new camera whilst the lens of its predecessor is refusing point blank to open. Himself has offered me the use of his camera but with no dedicated viewfinder I'm floundering. I did manage to use it to capture one or two photos of our little garden outside the caravan which for this year is a voyage of discovery. Primroses and daffodils were the order of the day in March/April but as May unfolded the unidentified shoots have revealed their true colours. So far we have bright yellow Welsh poppies, bluebells, an unknown euphorbia, a little white flower which I think is stitchwort, 'Solomon's Seal' and still to flower 'Jacob's Ladder' whilst at the back of the caravan we have our very own glade of bluebells. I'm planning on a little tweaking here and there. There will definitely be some snowdrops sneaking their way in and maybe the odd pulmonaria and fern. We have just had some decking installed which makes getting in and out of the van so much easier and where we will be able to sit out comfortably come better weather. There is room for a couple of containers so thought is now going on to what to plant them up with. The allotment planting is slowly coming together. If only I could get on top of the weeds! The strawberry bed has been strawed and it looks as if there will be a good crop this year. The goosegogs are swelling along with currants - red, white and black. Mange-tout peas 'Carouby de Maussane' and the climbing French bean 'Cobra' have been planted. Potatoes and shallots are making progress. Broad beans, more French beans, borlotti beans, courgettes, pumpkins and sweetcorn will be in transit in the next few days from home to allotment so that they can be planted. I'm late with planting my sweet peas this year. The wigwams are assembled in readiness so that task is a priority this week. The greenhouse is now at that full stage although some residents are spending more and more time outside in readiness for planting. The tomatoes are still in full time residence along with various pots of seedlings which seem to have remained in a state of suspended animation for most of the month. I'm hoping that the predicted rise in temperatures for later this week is going to prompt them to get a move on. I've just started sowing some biennials in readiness for next spring. The wren's nest just outside the back door that I mentioned last month met with a sad end. Some unknown creature possibly a magpie demolished it. Prior to that though we had enjoyed much coming and going and we just hope that mother and babes did not come to harm and escaped in time. Our moorhen is still perching on the same branch most evenings from where it makes most distinctive squawks. Last night saw a slight change of scenery as the top of a bird feeder hanger was the viewing point of preference. We wonder whether he saw the same young fox that padded past our dining room window yesterday evening. After April's plant buying splurge I've been more restrained this month. I bought an unidentified russety coloured heuchera, a white flowering hesperis and a campanula 'Octopus' at our garden club plant sale last weekend. Our meeting this week saw another purchase in the shape of geranium 'Elke', which had been on my wish list for ages or so it seems. I was so pleased that our speaker included this in the selection of plants she bought with her. By the time our speaker had finished her talk I had added a couple more plants to that list. I also ordered a chrysanthemum collection for some autumn colour and some cuttings of dianthus 'Green Trick' online via Sarah Raven. This was the first time I've bought plants from this company and I was most impressed with both quality and speed of delivery. More end of month views from far and wide can be enjoyed over at 'The Patient Gardener's Weblog'. Thanks as always to Helen for hosting. Wordless Wednesday ~ "Who Lives In A House Like This?" Weather permitting bank holidays are usually spent at the allotment as himself refuses point blank to take to the roads. Today was no exception and a most productive day was spent planting French beans and mange tout peas as well as topping up some of the raised beds. There was the odd bit of weeding, the odd chat or two and I picked a handful of herbs for a vase. However the herbs I hit on, with one exception, did not like being snipped in their prime and went into full sulk mode back at base. Even being plunged into water did not do the trick - they have remained floppy and uncooperative so this necessitated a change of plan. So this is vase mark 2. Its ingredients are restricted to the allium schoenoprasum aka chive flowers from the allotment, along with just one head of allium hollandicum 'Purple Sensation' picked from the garden. They are sited on the mantelpiece above the fire in the living room. I have absolutely no idea how the vase fell in to my hands. I like its shape and feeling of chunkiness although it does not hold much. For the record the herbs that did not make it were bronze fennel, golden marjoram, sage flower buds and comfrey. They are sitting outside in a vase but on last inspection have not perked up at all. They may well be heading in the direction of the compost heap come morning. Other Monday vases crammed full of fabulous flowers can be admired over at 'Rambling In The Garden' thanks as always to Cathy. If feet could purr mine would be doing so now after a visit to my lovely podiatrist. Hopefully the niggling pain that has been making me draw sharp breaths for a couple of weeks or more is sorted. I've definitely been feeling rather out of sorts, even grumpy you might say, but I positively bounded home this afternoon in time to catch television coverage of the RHS Chelsea Show and then to do some potting up in the greenhouse. All most soothing. At long last the state of affairs is moving to that crescendo of the greenhouse shuttle. Sowing started late here this year, it has been staggered and there has been less of it. This was a deliberate decision which I thought would cause me some regrets. Strangely enough I've found it rather liberating, as for the first time in twenty five years or so I feel that I have a measure of control rather than pots of seedlings shouting the odds. The greenhouse may be untidy but there are no unlabelled pots or a queue of seedlings screaming at me to move to them to a bigger home ..... well not yet anyway. I'm not sure what will happen next year yet but will decide come the autumn and the new batches of seed catalogues. There have been the odd disappointments - four lots of seeds that have failed to germinate at all. Two lots of perennials from the same supplier and two lots of vegetable seedlings from the same source (but different to the perennials). I've come to the conclusion though that I've sowed lettuce long enough to know what I'm doing. I'm watching a tray of lunaria rediviva keeping fingers crossed that the one solitary seedling in there has some companions to keep it company soon. I'm taking some comfort in the fact that they can be slow to germinate. I'm most excited about the appearance of hablitzia tamnoides or the Caucasian spinach vine. I've been searching for seeds since I heard a talk by Alys Fowler on unusual edibles at the 2012 Southport Flower Show. This is a shade loving deciduous climbing perennial. It can be used as an ornamental plant to cover a pergola, has heart shaped leaves and produces small green flowers. The young shoots are edible. Alys advised at the time that it could be a difficult plant to get hold of and she was quite correct. My seed came from Thomas Etty Esq. The seedlings are much to small yet to move to the big outdoor world of the allotment and will probably stay closer to home for a year or so, before I expose them to that environment. Maybe next year I will be able to have a nibble and report back. Is there anything that you are particularly pleased to have sown from seed so far this year? A spring stalwart in my garden is geraniun phaeum in various shades. These are such easy going plants that just get on and do their own thing with little need for human intervention. This plant is what is often referred to as a "good doer" and is happy to oblige in any soil in full shade, partial shade or full sun. It's one of those plants which will even grown in dry shade. They can grow quite tall but somehow or the other keep themselves upright without the need for support, attract bees but seem to repel molluscs. What more could you ask for? There's a little catch or two as there is with many plants. The plant does spread somewhat around the girth and also seeds about a bit but I can live with that. I've several of these geraniums growing in the garden with the first appearing in early April but with others only getting into full gear now. Foliage colour varies and includes some variegated forms. My plants once had names but I've lost track over the years. The plants you see above are geranium phaeum album and the second is probably phaeum 'Lily Lovell' but I would not like to hazard a guess at any other of the others. They will grow under shrubs and trees and are perfect companions for a wide range of spring flowering bulbs and perennials. A good haircut after flowering will prompt fresh new foliage to emerge. Propagation is best done by division. I usually do so in very early spring but the plants can be divided any time in their dormant season. They are one perennial that I would not be without. Thanks as always to our lovely hostess Carol over at May Dreams Gardens who enables us to share our blooms each month as the year unfolds. In A Vase On Monday ~ "I Saw A Mouse"
The ingredients of this week's vase are geranium phaeum - one with plain leaf and one with dark blotches, anemone sylvestris, primula vulgaris 'Dawn Ansell', some foliage interest from rosa glauca prunings (which kick-started the vase) and a little mouse in the form of a flower of arisarum proboscideum, commonly known as the mouse tail plant. The little milk jug has been aired in public before and was given to me by my mother many moons ago. I would like to be able to say that no mice have been harmed in the making of this vase but I have a feeling that this little creature may soon wither. Thanks as always to Cathy over at 'Rambling In The Garden' for brightening up the start of the week. 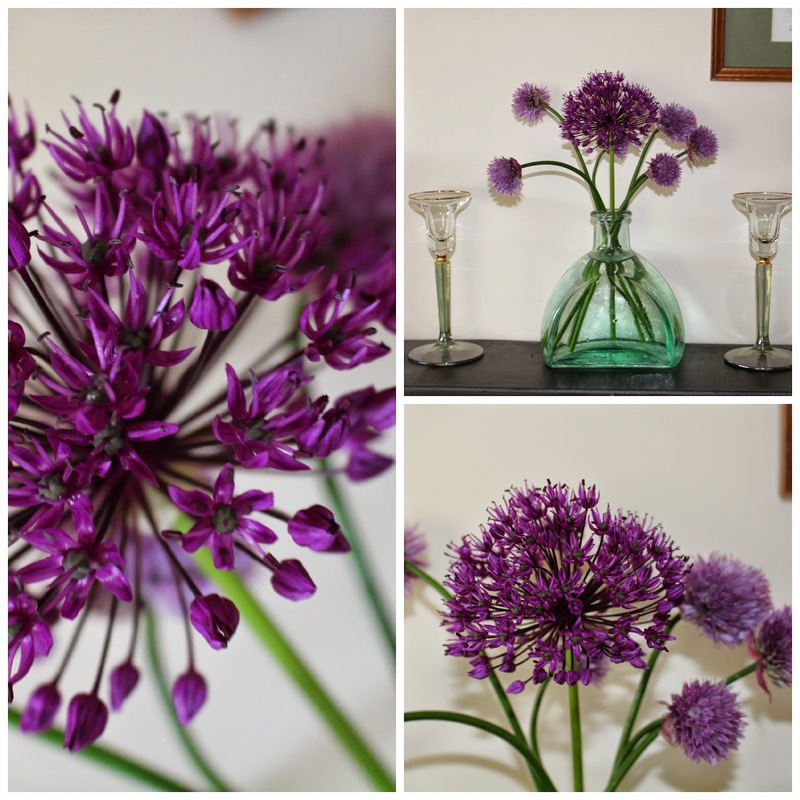 Do pop over there and enjoy other vases of fabulous flowers from far and wide. an extract from 'Pear Tree' by Hilda Dolittle. Alongside her companions have also been flowering. 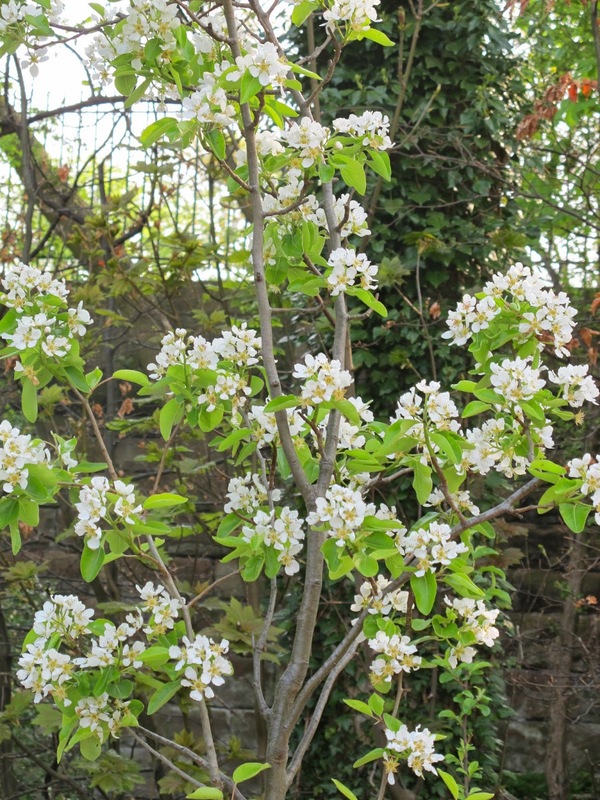 The other pear tree was first to flower whilst although the crab apple 'Red Sentinel' was last in the race it still retains most of its blossoms. I'm hoping that the extra petal power provided by the crab apple will increase the productivity of both of the pears. All three trees escaped the cold weather at the end of April, which sadly frosted the blossoms on one of my apple trees at the allotment. From now on I shall be watching my pear tree with bated breath for the embryonic fruits to start swelling. I hope that they heed the words of the poem. In other news I think that she has gained some height - either that or I've shrunk. You can catch up with what is going on with other wonderful trees over at 'Loose and Leafy'. Thanks as always to Lucy for hosting.